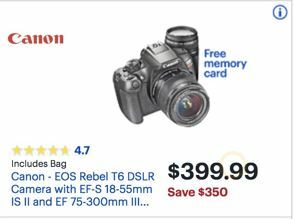 Find the best Canon EOS Rebel T7i camera deals on Black Friday 2019 or Cyber Monday. Funtober will search Amazon, Canon, B&H, Adorama and more for the big sales on Canon’s new amateur camera for digital photography. 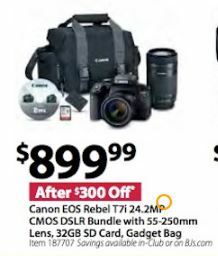 We will also have online and in-store price discounts on the Canon Rebel T6 camera from Thanksgiving Day to Cyber Monday 2019. 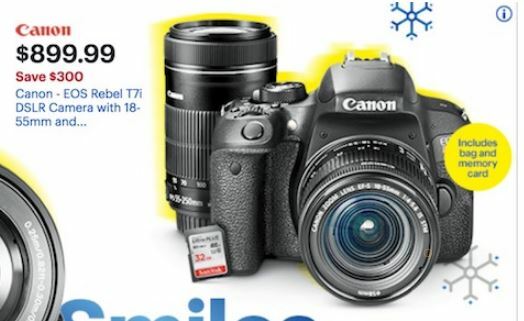 Canon upgraded its most popular series of consumer DSLRs from the T6 to the Rebel T7 and the T7i in February 2018 with what has become known as a beginner and budget friendly DSLR. What is the difference between the Rebel T7i and the Rebel T7? The T7i has a tilt-swivel screen for maximum flexibility, a touchscreen view just like your smartphone, built-in bluetooth for wireless connectivity, longer battery life for an extra 100 photo shots, an external mic jack, better autofocus performance. What is the difference between the T7i and the T6i? We have collected a few of the differences between Canon’s top two digital consumer cameras. The T7i has the newer DIGIC 7 processing engine that first surfaced inside the PowerShot G7 X Mark II. It has a slightly higher pixel count of 25.8 compared to the 24.7 of the T6i. The top end ISO increases from 12,800 to 25,600, and the entire range can now be accessed via the Auto ISO compared to the more limited range available in the T6i. Canon added the smallest non-retractable DSLR kit lens in the 18-55mm range with a four stop image stabilizer. It also has what Canon is calling “the world’s fastest live view autofocus” with a speed as low as .03 seconds (under certain conditions and with particular equipment). 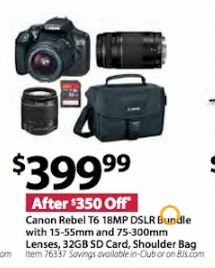 The Rebel T7i is typically priced at between $749 and $799 for the initial entry level package with the advanced two lens bundle priced at an additional $200 – between $949 and $999 regular price. 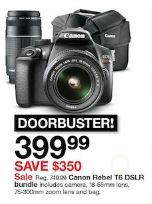 For Black Friday and Cyber Monday prices, expect that the doorbuster sale will discount this price by between $150 and $200 to make the cost for adding this digital camera to your bag for between $599 and $799 or so. These estimated prices are based on the average deal that we saw during Black Friday 2017 on the T6i, so it is possible that the actual discount when it is announced in November will be slightly higher or lower. 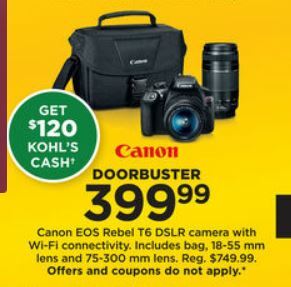 The camera deals from manufacturers like Canon are usually announced in the middle of November but you will probably get a preview of what the best deals of the year will be when they start to get released by Kohls, Best Buy and others. 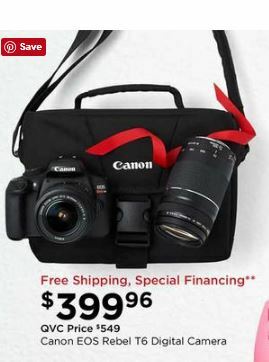 We will definitely see a few Canon cameras like the EOS Rebel T7 or T7i available online during a big sale on the Monday after Thanksgiving. 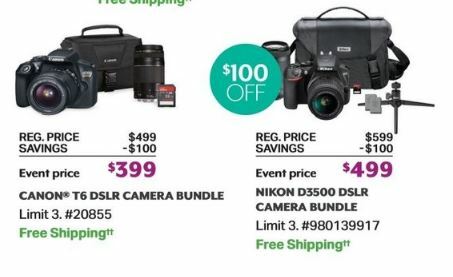 The Thanksgiving and Black Friday sales are typically a little better from the manufacturer than the Cyber Monday deals but you may be able to get a cheap price on the latest Canon Rebel camera if you look on a photography eCommerce retailer like B&H or Adorama.